In medium bowl, crumble cookie dough; stir or knead in flour until well mixed. Shape dough into 36 (about 1-inch) balls. Roll and slightly press balls in pecans (do not flatten). Place 1 inch apart on ungreased cookie sheets. Bake 8 to 12 minutes or until edges are set and light golden brown. Using back of round metal measuring teaspoon, make 1 1/4-inch indentation in center of each cookie. 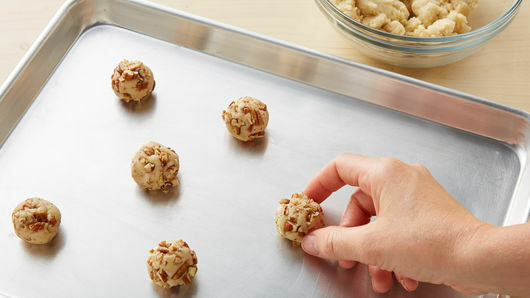 Cool 1 minute on cookie sheets; remove to cooking racks. Cool completely, about 30 minutes. In small microwavable bowl, microwave caramels and whipping cream uncovered on High 1 to 2 minutes, stirring after 1 minute, until caramels are melted and smooth. Spoon about 1/2 teaspoon caramel in center of each cookie; sprinkle with salt. Immediately top each caramel-filled cookie with 1 candy, slightly pressing into caramel. Let stand about 10 minutes or until caramel is set. Store covered in refrigerator up to 1 week. 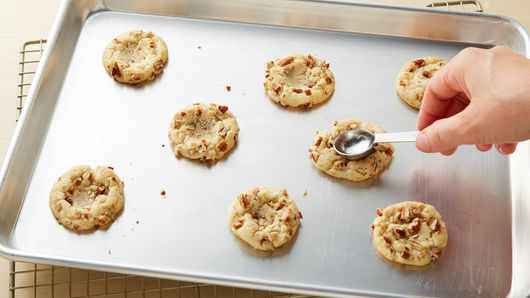 To easily spoon caramel in center of each cookie, cool caramel slightly, and spoon into resealable freezer plastic bag. Cut tiny corner off bag, and pipe into center of cookie. 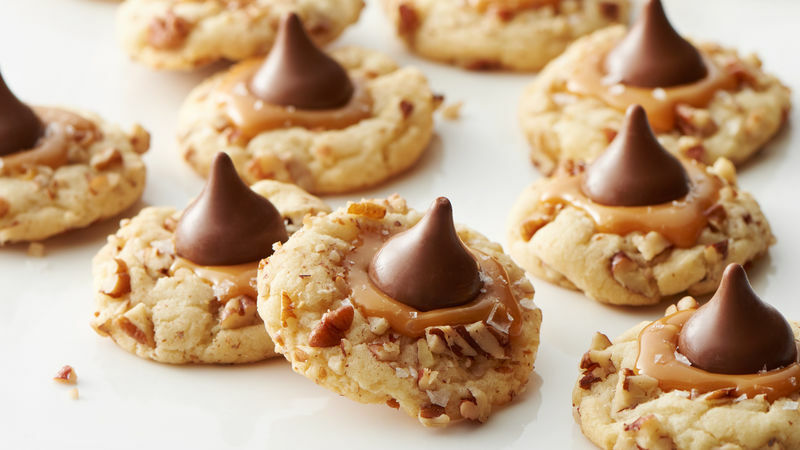 The Hershey’s™ Kisses™ with caramel add extra caramel deliciousness to these cookies. Like dark chocolate with your caramel? 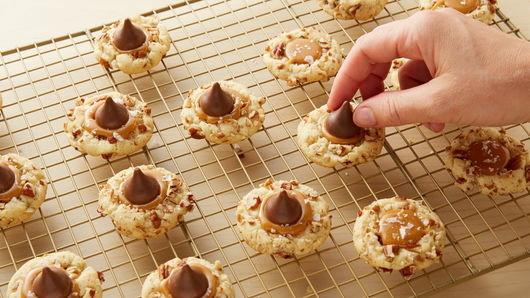 Substitute Hershey’s™ Kisses™ dark chocolate candies for the caramel candies.